A salient fact about family life that decades of worrying only about oneself may fail to imprint upon one’s psyche is exactly how much your family depends on you to be a certain way. This year I got KO’d by an accident and failed to notice the impact that it had on my own family – especially my son, JR. Though the wheels were a little loose for a while it all worked work out well in the end - the upshot being an entire chapter (that practically wrote itself) in my upcoming bestseller: “The Guide to Becoming a Family Guy for the Fantastically Inept." Before coming to Idaho I spent most of my youth in a lifestyle that involved climbing, skiing and living out of the back of a pickup truck. Back then I could go anywhere my meager resources would take me without worrying anyone. I got used to all that freedom and it’s been a little hard to shake to this day. Then there's the issue of sweat equity and how it rings up. I've heard it said that most motorcycle racers tend to have some things in common: a hot spouse, cool kids and a limp. True that. But sometimes I think that we view that limp (and how we got it) in ways that our spouses and kids do not. I'm pretty sure that's not right. When you’ve got an anxious significant other, a precocious youngster, a posse of assorted critters and family photos where the motorcycle posters used to be, stuff’s got to change. I’m pretty sure that I’m starting to grasp the concept. Honest and no lie. I don’t know how you come down on the whole nature/nurture thing but my experience suggests that the apple doesn’t fall very far from the tree. JR shares my enthusiasm for things that go fast and make noise – especially motorcycles. 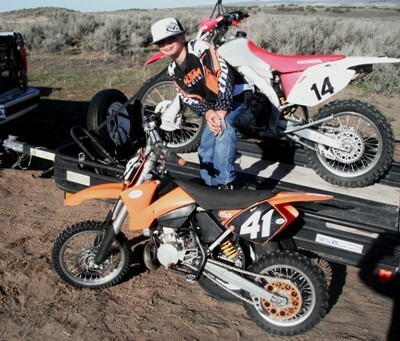 JR has been riding since he was very small on a succession of mini bikes up to his current ride – a little KTM SX65 two-stroke screamer (the kind of thing that gives mom’s everywhere a heart attack) that Grandpa Moon and I bought for him so that he could race proper. He’s been all gung ho about it. 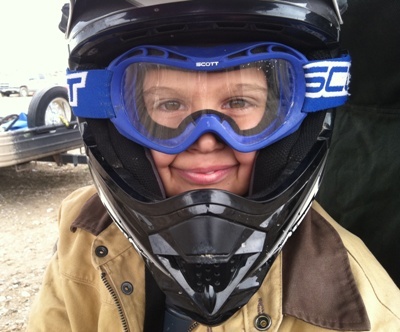 In his first race this year he got so frustrated by another kid who was blocking him from passing that he used a large boulder, a course obstacle that was supposed to be ridden around, as a ramp to launch himself over the other racer and into first place – all right in front of his mom. I think that there’s a good argument for what part of all that actually best qualifies for family legend status. JR and I are fortunate enough to have our own mini track up at our place and we normally spend a fair amount of time racing each other around it. JR’s a pretty competitive little rascal and completely unwilling to acknowledge that my 385cc engine advantage means anything. He whoops and hollers and flies around that track just like a joyful low-flying ICBM – or at least he did until I went down this summer in a riding accident. I come from the school that says that if you fall off a horse you rub some dirt on the owee, cuss a little, and then get back up into the saddle. That’s what I’ve done after mishaps in climbing, skiing and motorcycling so numerous I can’t even begin to remember them all. So I failed to understand the impact on my young son that a week of watching Dad connected with tubes and wires to intimidating medical machines in the hospital might have. Looking back on the whole thing now I can see it plain enough, but at the time I was more concerned with upholding tradition and being a stoic tough guy. In the process I forgot about what it must be like to be seeing something like that through the eyes of a 9-year old who expects that Dad is indestructible. It wasn’t until we started racing again in October that I noticed that JR was just not into riding motorcycles anymore. He retired from our last two races after a single lap each. Every time I asked him if he wanted to ride just for fun he said no. Though I knew, at some level, what the problem was, I didn’t want to believe it. The thought that I might have ruined motorcycles for my son was huge. So I told him that it was OK if he wanted to take a break but that if he changed his mind the bikes were always ready to roll. After a while he started talking with me about the accident, the week in the hospital and how much it scared him. And once he got it all out he was ready to get back on that horse himself. So a few days ago we went out to Lake Channel and JR let loose in the sand. The old JR. I knew that he’d gotten his mojo back when I had to chase him down a ditch at the end of the day to get him to ride back to the truck. And dad learned a powerful lesson in the process: never leave your wingman behind.